There is a long history of deceptive practices and bogus military displays designed to project greater firepower than is actually available. In my military dictionary, this is known as creative deterrence, or deterrence on the cheap. A classic case in point occurred during the July, 1955 Moscow Aviation Day, which stoked fears in the United States of a bomber gap. The bomber gap preceded Sputnik; the missile gap would soon follow. President Dwight David Eisenhower took heavy flak for downplaying all three, believing these threats to be inflated and not as important as trying to hold the line against budget deficits. Ike’s public reaction to Sputnik, just six weeks after the Kremlin launched the world’s first ICBM, was purposely low key. The Soviets merely “put one small ball in the air” which did not raise his apprehensions “one iota.” Ike’s popularity plummeted. As early as 1948, US proponents of air power were issuing warnings of dire consequences over a bomber gap, calling for ramped up production. The January 1948 Report of the President’s Air Policy Commission, “Survival in the Air Age,” better known as the Finletter Report, called for 120 more bombers than President Harry S Truman thought advisable. The push to increase US production rates went into high gear after the July, 1955 air show, when the Soviets flew the same ten Bear and Bison bombers six times over the reviewing stand. Extrapolations of Soviet production rates, based on the sighting of 60 bombers, had the intended effect of unnerving an anxious country. Columnist Stewart Alsop (brother of Joseph) warned in the New York Herald Tribune that, “The Soviets will soon attain a commanding lead in aircraft capable of operating efficiently at intercontinental ranges.” Alsop had plenty of company. The bomber gap turned out to as fictitious as the Moscow air show fly-bys. —Avro Vulcan Bomber fansite link. I read that the U.K. spent a fortune on the Vulcan Bomber, trying to play in the nuclear big leauges. Then the first ICBM was made, and made the Vulcan obsolete overnight. No, the Vulcan doesn’t relate the Bomber Gap. The Operational Requirement was issued in 1947, the first full-size prototype flew in August 1952, the first operational plane flew in February 1955, and IOC was in July 1957. A look at the actual numbers of operational strategic bombers is illuminating, because the Soviet Union never came close to matching let alone exceeding what the United States put in the air. The bomber gap was illusory, but its effects on US bomber deployments and spending were anything but. In all, between 1950 and the mid-1960s, the United States manufactured nearly 4,000 strategic bomber aircraft in eight variants (B-50, B-36, B-45, B-47, B-57, B-52, B-66, and B-58), as well as approximately 900 KB-29, KC-97, and KC-135 aerial refueling tankers to support the worldwide operations of this massive fleet. Sources: Robert S. Norris and Thomas B. Cochran, “US-USSR/Russian Strategic Offensive Nuclear Forces, 1945–1996,” NWD-97-1 (Natural Resources Defense Council, January 1997), Table 1; Pavel Podvig, ed., “Russian Strategic Nuclear Forces (MIT Press, 2001), p. 350; Stephen I. Schwartz, ed. “Atomic Audit: The Costs and Consequences of U.S. Nuclear Weapons Since 1940,” (Brookings Institution Press, 1998), pp. 108-09, 112-18. I do have a bit of an issue calling the B-45, B-57, and B-66 “strategic”, though their total numbers don’t mount up to much and with some of them the dedicated recon versions lost their bomb bays. I have to agree with Captain Ned on this one. The general point of the article is valid, but it isn’t served by citing numbers that seem to compare only the USSR’s Tu-95 and Mya-4 force against, basically, everything the USAF ever flew with a B- number. If the B-47 counts as a strategic bomber, so does the Tu-16A, and there were about 400 of those. The Soviet Union did suffer from a modest Bomber Gap during the early Cold War. The truly significant shortfall, buried in the footnotes, is the Tanker Gap. And I don’t recall any of Eisenhower’s critics bringing up that one. The B-47 was most assuredly a strategic bomber, as evidenced by the fact that it could carry eleven different types of nuclear bombs (not all simultaneously) and was fully integrated into US nuclear war plans. (For their part, the B-45 carried three types of nuclear bombs, the B-57 carried two types, and the B-66 four types.) True, the B-47 was not a very long-range aircraft, but SAC compensated for that by basing it in the United Kingdom and Morocco, and rotating it through other forward bases, and by purchasing more than 700 KC-97 aerial refueling tankers to get the planes to their targets and back again. Source: Thomas B. Cochran, William M. Arkin, Robert S. Norris, and Jeffrey I. Sands, “Nuclear Weapons Databook-Volume 4: Soviet Nuclear Weapons” (Harper & Row, 1989), p. 229. Cochran et al cite the annual reports of the secretary of defense from 1964-68, which at first counted a portion of the Tu-16A force as strategic forces but then excluded it altogether. 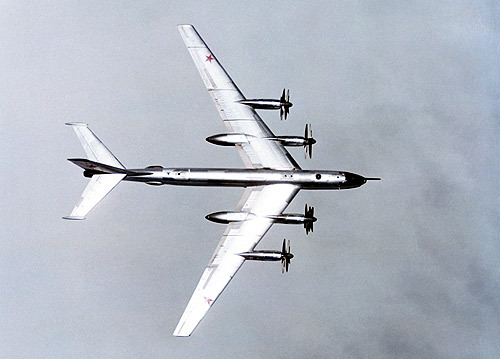 I remember the Aviation Week issue with drawings of six-engined bomber resembling the Bear. About four years later we were assailed with a drawing of the Bounder, except it was billed as a super-sonic nuclear powered bomber. There was – and is – endless hype of impending threats none of which ever really happened. There was no ‘bomber gap’, nor ‘missile gap.’ Reports of Soviet spaced based lasers in the late 1970s, the ‘zap gap,’ were just hype to justify buying more bombers, missiles, and star wars. “The Window of Vulnerability” served to terrify Americans for decades, always receding into the future each year, ever ominous. Senator ‘Scoop’, Jackson (D-Boeing) described the Cold War as a ‘permanent jobs program.’ So it was, and with China, Iran, and Korea as the new ‘threat,’ we will continue to justify what are by far the most expensive armed forces in the world. Those are fascinating articles. It all kinda gives me the creeps and makes me want to stock up on guns and bunker down. Though guns wouldn’t do much good against a bomber. In the summer of ’79, when the Senate Armed Services Committee was chewing on SALT II, one of the hot buttons was the Soviet Backfire bomber, which was not covered by the treaty’s limit on strategic nuclear delivery vehicles. No matter, said SALT proponents — because the plane is too short-legged to reach U.S. territory. Well, who better to ask about the capabilities of a particular bomber than Gen. Russ Dougherty USAF (ret. ), late CINCSAC and a guy who had spent his whole career flying bombers. And so Gen. Dougherty duly appeared before the committee. Maybe not in 1950, but certainly long before ’79, nuclear war was already a one-way mission for nearly all of us. Lambda Chi Alpha website on Dougherty. Have you seen any parallels between the history of the “bomber gap” argument and the justifications for the next-generation U.S. bomber? Doesn’t seem to be any major public debate about it yet, but wonder if that will change as program progresses and deficit pressures persist. The next-generation bomber is worth discussing, but not as a parallel to the “bomber gap”. There is little or no discussion of anyone else’s bombers in the justifications put forth for the US next-generation bomber. And certainly no concern that the United States will be attacked by anyone else’s bombers. In the 21st century, American bombers are a tool of asymmetric warfare. We don’t want or need to have more bombers than the Russians or the Chinese. We maybe do want or need to have more bombers than the next Hussein or Bin Laden has ratholes to hide in. And fast and stealthy enough that he never knows what hits him. Or maybe we don’t want or need that. But that is the (oversimplified, of course) case being made for a new bomber.